When Denver's Lowry Air Force Base was placed on the 1991 BRAC list, area businesses and residents were worried. A major training center and the primary school for the Air Force's space flight program, Lowry cast a long shadow across the local economy and culture. Directly employing an estimated 7,000 people, it also housed thousands of families, many of whom spent their money and time in the surrounding community. The base's closure on April 27, 1994 not only removed a major employer but also took a big chunk out of the area's population -- and threatened its economy. Tom Markham, the executive director of the Lowry Redevelopment Authority (LRA), still remembers when Lowry shut its doors: "When a base closes, the surrounding community loses jobs, as well as a major economic engine." Luckily, the federal government was quick to step in with funding, including development and infrastructure grants. Markham credits these programs with helping Denver and the nearby city of Aurora to get over the loss of Lowry: "We took advantage of those grants where we could. They were important in the early years." Many base towns struggle to fill the void left behind by the military, but Lowry's closure coincided with a real estate boom in Denver, offering the LRA a unique opportunity -- and unique problems. Rather than having to worry about filling the empty base, the authority was able to focus on preserving the area's lifestyle and character. "Our first goal at Lowry was to make sure that development was compatible with the surrounding areas," says Markham. "For example, nearby neighborhoods didn't have big-box retailers, so we didn't [build] big-box retailers." Gordon Von Stroh, a management professor at the University of Denver who was involved with the development, says planners were concerned with ensuring that "there's a nice transition from existing communities into the new communities." "Education was part of the base's legacy," says Markham. "We wanted to continue that tradition. We set a goal of 10,000 residents, 10,000 jobs and 5,000 students. We're almost there." In addition to a Denver public school and high school that are located on the former base, Lowry is also home to community college campuses for both Denver and the nearby city of Aurora. The military's legacy also remains in other areas. Although the LRA decided to demolish Lowry's landing strips, it saved and reused more than 30 military buildings that have historic or architectural value. Two old hangars have been repurposed as the Wings Over the Rockies Air and Space Museum, and another one has been turned into the Big Bear Ice Rink. Other buildings are now filled with classrooms or condominiums. Sixteen years after its closure, Lowry is, once again, a major economic machine in the Denver area. As Markham notes, between 1994 and 2008, the redevelopment contributed over $5.7 billion to the local community. Yet even now, he acknowledges how lucky Denver was to have benefited from a strong local economy and a city that was primed for development. Most of all, he notes, "We caught the market just right. I'd hate to be closing on 1,400 acres today." 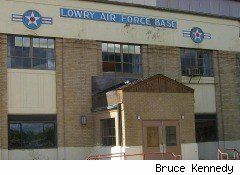 When Lowry Air Force base closed in 1994, the surrounding area not only lost a major employer (that supplied some 7,000 people with jobs), but it also took a big chunk out of the area's population -- and threatened its economy.